In its 175 years of its existence, Cadenhead’s has survived against all the odds. A shocking death in the 1930s; a notorious auction in the 1970s… Scotch whisky’s oldest independent bottler has quite a tale to tell. Thijs Klaverstijn reports. To the modern whisky drinker, Cadenhead’s – or William Cadenhead, if you prefer – is intertwined with Springbank distillery. They share the same owner and conduct business using a similar philosophy (more on that later). But Cadenhead’s has been around for 175 years, making it the oldest independent bottler by quite a margin. For most of those years, it wasn’t part of J&A Mitchell in Campbeltown, but instead was based in Aberdeen. The anniversary was not only celebrated during this year’s Campbeltown Festival, but also with special releases, including an impressive sextet of closed distilleries, reminding us of the vastness of the Cadenhead stocks. The company is a fixture in today’s whisky landscape, but has travelled a long and bumpy road to get there. It all begins in 1842 in Aberdeen. George Duncan established himself as a vintner and distillery agent at Netherkirkgate 47, the iconic address of what would later become the first Cadenhead’s shop. One of the distilleries in his portfolio was Huntly, which closed in the 1860s. 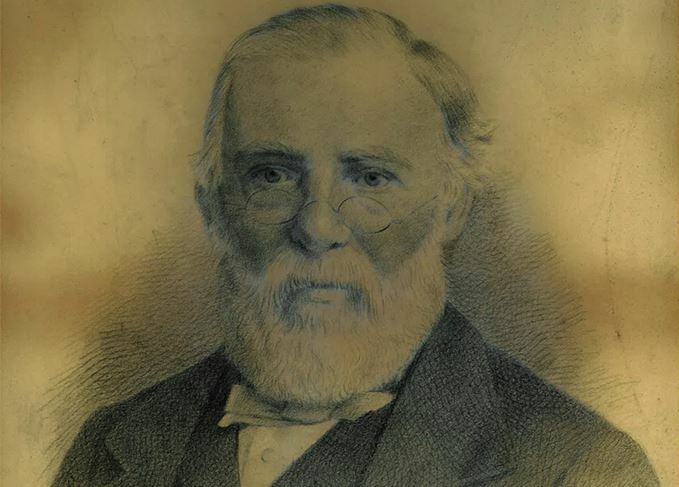 His business thrived in the early years, which led him to employ one William Cadenhead. While not much is known of Duncan, a great deal more is on record about Cadenhead. When Duncan died in 1859 after a short illness, it was Cadenhead who acquired the business and quickly changed the trading name to his own. He even wedded his former employer’s widow. ‘Her dram was good, but O, her ale! At the first annual supper and ball of the Aberdeen wine and spirits trade in 1886, Cadenhead delivered a speech that offers an insight into the climate in which he and other colleagues operated. The Scottish temperance movement, which was most active in the years before the First World War, had already had an impact on society. Cadenhead lived to see his 86th year, which would have been quite a remarkable feat at the time, if not for his two sisters and three brothers, who all lived even longer. His oldest brother, Peter, died aged 97. The death of William Cadenhead in 1904 meant that his nephew, Robert Duthie, who was already a partner by then, took over. Born in India, where his father was superintendent of the Scottish Orphanage in what is now Mumbai, Duthie came to Aberdeen as a young boy. He was quiet and unassuming, but developed the products for which the firm became most famous: single malt Scotch whisky and Demerara rum. Duthie established whiskies such as the deluxe blend Putachieside and The Heilanman. This quiet gentleman turned out to be instrumental in pushing the company forward and establishing it as a brand, rather than just a merchant. Then, in 1932, tragedy struck. In the depths of the Depression, the business was in poor shape. Legend has it that, while on his way to see his bank manager, Duthie was run over and killed by a tramcar. A bachelor, Duthie left Cadenhead’s to his sisters, who had no knowledge of the spirits trade. And so responsibility for the business was handed to Ann Oliver, a long-term employee, ushering in another new era. Oliver was eccentric, running the business in her own way. She refused to change with the times or the market in whisky sales, and was a perfect client for the Aberdeen salespeople of the time. She bought freely and liberally, from casks to bottles to boxes full of labels. When she was finally forced to retire and sell, it was discovered that Oliver was averse to keeping records. Without any documentation, the company was deemed unprofitable. The bonded and duty-paid warehouses may have been full to overflowing, but no-one knew the value of the stock held there. The bank assumed that the company was in terrible shape, resulting in a now legendary auction of the entire stock of Cadenhead’s. Not a single item had a reserve price. The sale took place at Christie’s in October 1972 and, contrary to expectations, it netted a six-figure surplus above and beyond the firm’s liabilities. The auction broke all records. Among the lots in the catalogue were five hogsheads of 1967 Macallan, 10 hogsheads of 1967 Glen Mhor, five hogsheads of 1965 Rosebank and two hogsheads of 1963 Talisker. Also included were many already bottled wines, rums and whiskies. Meanwhile, someone in Campbeltown took notice of the situation in Aberdeen. That someone was Hedley Wright, owner of J&A Mitchell & Co, the firm that also owns Springbank. Wright is a modest man and notoriously private, never giving interviews and staying out of the limelight. Tellingly, at one recent edition of the Campbeltown Festival, attendees failed to recognise him, even when he was standing not far from his own portrait. One of the main attractions of buying the Aberdeen firm were the glass bottles, of which there was a shortage in the early 1970s. In his bid for the company, Wright stated that the glass bottles had to be included. Shortly after the Christie’s auction, Cadenhead’s officially became part of J&A Mitchell. The glass bottles, however, were nowhere to be found. Under new ownership, whisky became an even bigger focus of Cadenhead’s. In the following decades, the company opened dedicated Cadenhead’s shops, not only in Edinburgh and London, but also on the European mainland. It adopted the philosophy of its parent company, one that has made Springbank such a success story. Everything at Cadenhead’s is about giving back to the community and ensuring long-term stability. In the past five years, for example, the company has grown exponentially, but is hardly selling as much as it can. Keeping in mind the boom-and-bust cycle of the whisky industry, Cadenhead’s would rather go slowly than quickly. In an attempt to secure the future of his company, Wright, now aged 87, has ensured that Cadenhead’s (and Springbank and Glengyle distilleries) will pass into the ownership of a charitable trust when he dies. He has no heirs, so there’s no-one to leave the company to, but as the largest employer in Campbeltown, he doesn’t want to jeopardise the future of his business. And so Cadenhead’s – once again without a direct heir – will eventually go to the people of Campbeltown. Two Balblair vintages, Dalmore 45, Cadenhead Creations plus two Mossburn blended malts. Kicking off the New Year with a diverse trio of illustrious Cadenhead Dumpies. Why are other distilleries called Glenlivet? There’s only one Glenlivet – so why have so many other single malts also used the name? A quartet of Glenglassaugh wood finishes, accompanied by two indie-bottled Bunnahabhains.